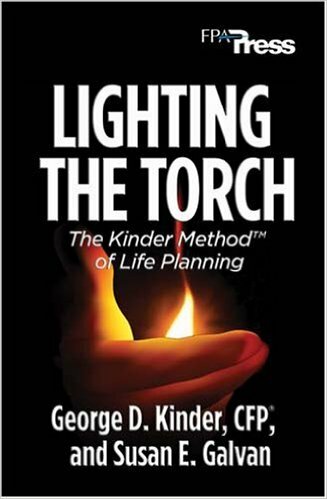 Lighting the Torch: The Kinder Method(TM) of Life Planning - IFA Vintage and Current Book Library - Index Fund Advisors, Inc.
Notes: Each of us carries within our hearts a "dream of freedom" where lives feel fulfilled and are truly worthwhile. Financial planners offer clients the most comprehensive opportunity to discover and integrate a financial life plan that in fact melds meaning with money. No other professional can help the client unveil his or her most profound dreams and values, and then articulate a financial strategy that empowers successful implementation. The book empowers planners with the processes for connecting the client's dreams of freedom with the strategies of financial planning. It provides training in the Kinder Method(TM) of life planning and a skill set that can provide a consistent and successful process with clients, leading to that moment called "lighting the torch."